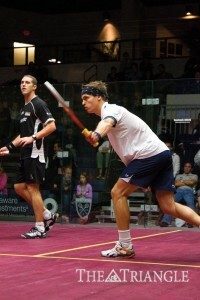 Two of the world’s Top-25 male squash players compete during the 2011 Delaware Investments U.S. Squash Open, which was hosted by Drexel on it’s specially-made courts in the John A. Daskalakis Athletic Center from Sept. 30-Oct. 6. The men and women’s squash teams competed in the first part of a two-weekend round robin this past weekend, Nov. 5 in Annapolis, Md. The Navy Round Robins will wrap up this weekend, Nov. 12-13, when both teams go back to Maryland, the men for three matches and the women for two. In the first weekend of play, the men won one of three matches while the women were unable to pull out a victory in their two matches. There were, however, good things that came from last weekend’s events when it was announced that Drexel’s top seed, sophomore Justin Singh, won Harrow Sports College Squash Player of the Week. Singh won all three of his matches over the weekend, including a great matchup against Navy. Singh’s play seemed to really excite the team as they were able to win more matches against Johns Hopkins, and then they won their final match against Fordham. The team is excited to get back down there because they know they can play better and get more wins this weekend. The men are up against it because they are ranked lower than most of the teams they are competing against in Maryland. The team has won before as the underdog, and their coach thinks they can do it again. It is just all about mindset. The women had a little bit of a tougher weekend as they could not pull out a victory, but along with the men, they know they can win. It is just a matter of getting off to a better start. White believes that the team will turn it around this weekend and that they can come back to campus with a few more wins in their pockets.